July 5 marks the 25th anniversary of the premiere of Seinfeld. This piece originally ran on March 15, 2013. Seinfeld has fully permeated the contemporary lexicon, and it goes well beyond phrases the show coined. Sure, “master of your domain” and “Soup Nazi” will always be with us, but the show also left its mark on everyday phrases and occurrences. Even though it’s been off the air for, gulp, more than fifteen years, sometimes it seems like Seinfeld will always be with us; there are so many quotidian objects or actions that now can never bump against you without the show insidiously flashing through your brain. Admit it: You can’t hear “helllooo” without hearing it in Jerry Seinfeld’s voice. … Newman. You have to say “Newman” after any protracted vocalization of “hello.” Even if it’s not meant to be sneering, you must complete this circuit lest there be a rift in the universe. Are these a disgusting candy you probably shouldn’t buy in the first place on account of how gross they are? Yes. But even if you wanted to buy them, you can’t without reliving Elaine’s sudden descent into becoming George. So delicious and yet so linked to Kramer’s surgical mishap. 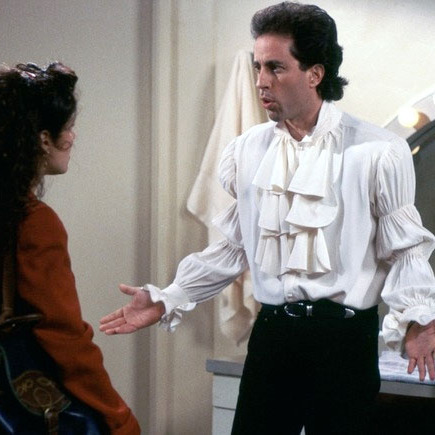 It’s in danger of being a Puffy Shirt. And that would be a disaster. Even if it’s an appropriate amount of money to have in change, it just feels like you’re Kramer trying to pay for calzones with hundreds of pennies. Luckily, it doesn’t come up that often. But when it does, anyone who has less than total enthusiasm for it is Elaine Benes. Say no to low-flow shower heads! Embrace your inner Kramer. Sometimes you really do need to use that phrase, but there’s no way to say it without feeling ridiculous. Can you spare a square? Without thinking of “can you spare a square”?